Particle physicist Dr. Rikkert Frederix is to receive the highly-endowed Sofja Kovalevskaja Award of the Alexander von Humboldt Foundation. 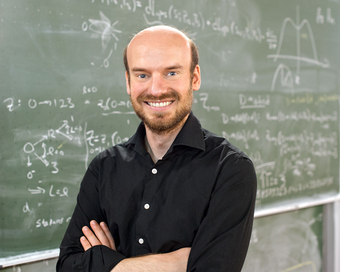 He will establish his own research group in the Physics Department of Technical University of Munich (TUM) with the goal of discovering what holds the world together at its innermost core. What does the universe consist of? This is the question that is being pursued by elementary particle physics. Researchers in this field are searching for the fundamental building blocks of matter. The experiments being done at the world’s largest particle accelerator, the Large Hadron Collider (LHC) in the European particle physics center CERN, for example, involve observing billions of particle collisions which in turn create new particles. Highly-precise theoretical calculations and simulations are required to evaluate these experiments. This is what the elementary particle physicist Dr. Rikkert Frederix, who until recently was a researcher at CERN, is developing. The physicist is one of this year’s winners of the Sofja Kovalevskaja Award of the Humboldt Foundation. The award will be officially presented in November in Berlin. It enables scientists from abroad to work on research projects in Germany at an institute of their choice and to set up their own research group. Frederix chose the Physics Department at TUM for his project. For five years he will conduct research with his own research group in the Theoretical Elementary Particle Physics Group. The physicist focuses on calculations of collisions of high-energy particles in particle accelerators. These theoretical predictions are compared with the actual results of the measurements in order to improve the current standard model of particle physics. Frederix is concerned in particular with the automation of these calculations. Dr. Frederix was born in 1982 in the Netherlands. He studied physics in Utrecht and Amsterdam. In 2005, Frederix moved to the Centre for Cosmology, Particle Physics and Phenomenology of the Université catholique de Louvain in Belgium, where he received his doctorate in 2009. From 2008 to 2009 Frederix worked at CERN in Geneva with support from the EU’s Marie Curie Programme, from 2009 to 2012 he was a postdoc at the University of Zurich. In 2012, Frederix again moved to CERN. Since August 2015, he has been working at the Technical University Munich.